You attended Drum Corps International's spring cinema event "The Countdown" on Wednesday, May 13 at more than 400 select theaters across the country; now we're asking YOU to make the call. This is your chance to be the judge, ranking and rating each of the six corps performances that you saw up on the big screen. Log in to a specially designed DCI.org adjudication application to mark your scores for each performing corps in general effect, visual, brass, percussion and color guard. 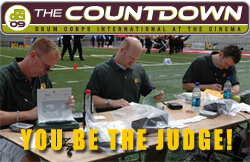 The corps receiving the highest average scores when judging is completed after Tuesday, May 19, will own bragging rights as "2009 Countdown Champion." Top scorers in each caption also will be recognized. Stay tuned to DCI.org for the results!